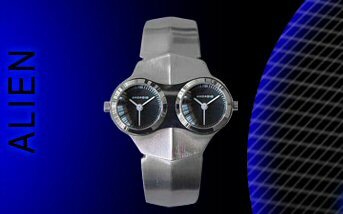 Yet Another Watch, The Alien From Android USA | OhGizmo! Oh, let me tell you, I’m having a watch indigestion. I’ve written enough about them in the last three hours to last me three months. That’s why y’all aren’t gettin’ no fancy writeup on this one. It’s just another cool looking watch, from Android-USA. Kind of looks like an alien, or maybe some guy with a bio-hazard mask. It’s $100, you can get it here.